A fan who bumped into drummer Matt Helders in L.A. claims he revealed when the band are hoping to release their new LP. Arctic Monkeys could potentially be releasing a new album this year. 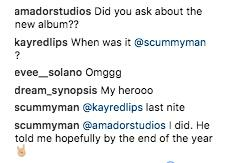 According to mega-fan, Will Franco - who bumped into Matt Helders at Royal Blood's gig at The Wiltern Theatre in L.A - the rocker confirmed their new album will drop "hopefully by the end of the year". When asked in the comment section if he quizzed Helders about the new record, the fan replied: " I did. He told me hopefully by the end of the year". While we can't confirm if the reports about the follow up to 2013's AM are true, one thing we can all agree on is that the band's frontman loves a bit of karaoke.